This past week I was thrown back into the active and engaging Winnipeg life I love after two months in Mexico where my toughest decisions every day were whether to golf or go to the pool, which book I should read next, whether to have white wine or a margarita for happy hour and which of my many writing projects I wanted to pursue. Now that I am back home I can tell my brain is out of practice juggling all kinds of commitments and responsibilities. I’ve been showing up in the education office at the art gallery every time I have a shift to ask where something is or how to handle a situation. I got lost driving to my daughter-in-law’s concert on Wednesday night even though I was going to a venue I had been many times before. I went to the grocery store to buy food for the three social occasions we are hosting this weekend and left my long grocery list at home on the counter. I can’t find my favorite belt. I booked some of my university students for observations on days they didn’t request. I am the secretary for a Winnipeg Library Advisory Council. When I sent out the minutes of this week’s meeting one of the members kindly pointed out eight mistakes I’d made. I am the librarian at my church and I forwarded this week’s Sunday bulletin update about the library to my aunt’s physiotherapist in Saskatoon instead of to the church secretary. I showed up at my writer’s group last night without my copy of the book we are discussing. I am not sure if this means I needed a longer holiday to rest my brain or……….. if my holiday was too long and I can no longer give my aging brain a two month break if I want to keep it healthy and firing on all cylinders. Hopefully I’ll be back into the swing of things soon! On a visit to our children’s home in Saskatoon at the beginning of November I went to the Remai Modern Art Gallery for the first time. What a beautiful place! My grandsons enjoyed the gallery especially the sunny spacious room at the Remai where children can do their own creative projects. Interestingly it was the work of a 91 year old artist that drew my six year old grandson’s most dedicated attention. 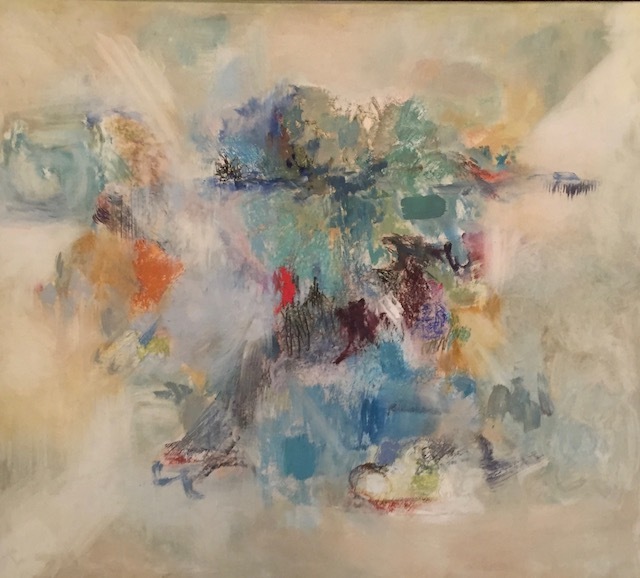 I told him the names of more than a half a dozen pieces of art by Dorothy Knowles and the next day when I showed him photos of those artworks he remembered the names of every single one. 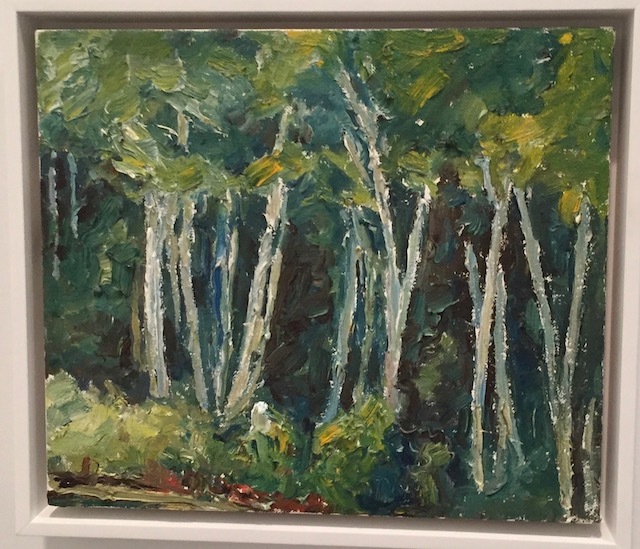 When he and I were drawing together one afternoon he suggested I try and recreate one of Dorothy’s paintings he liked the best called Trees. My grandson isn’t the only person Dorothy has impressed with her beautiful canvases. 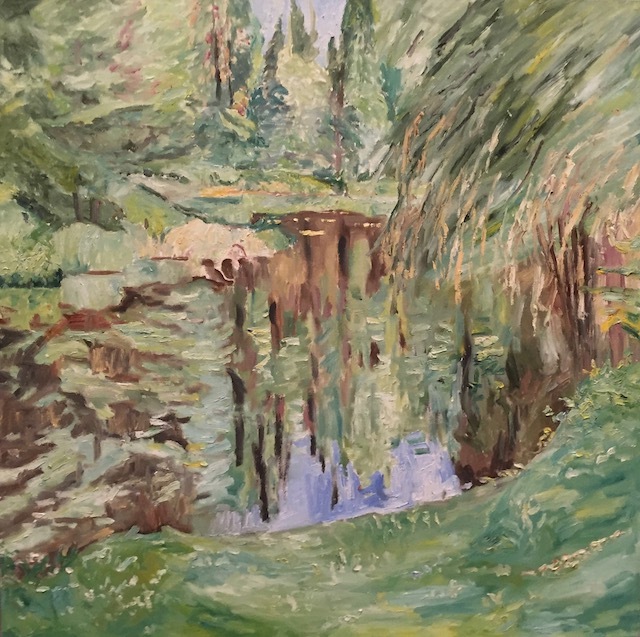 Her career began in the early 1950s when she enrolled in an art workshop at Emma Lake. She has been painting ever since. Dorothy has been given the Order of Canada for her contributions. 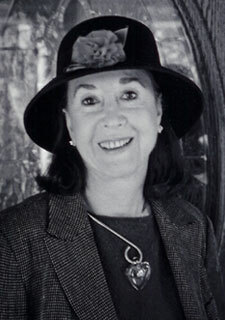 Her paintings are in galleries across North America and have been featured on Canadian postage stamps. 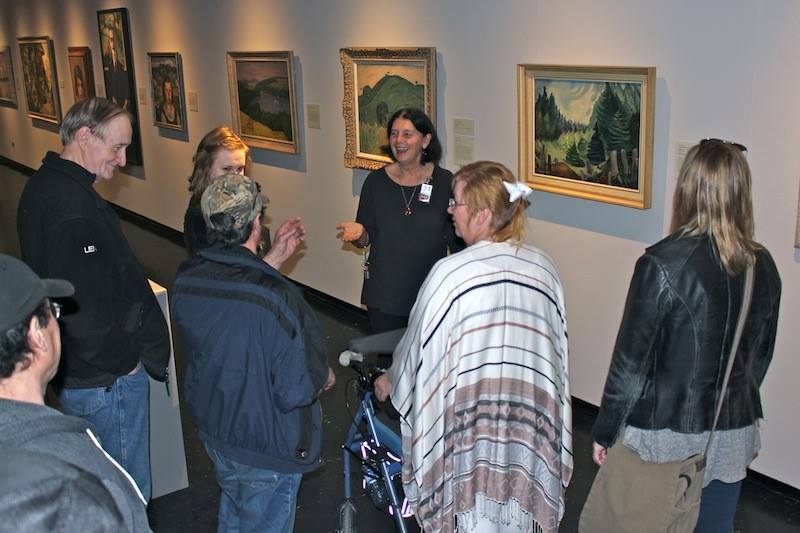 Her work reminds me of the Group of Seven and Emily Carr. Like those artists Dorothy often painted outside. 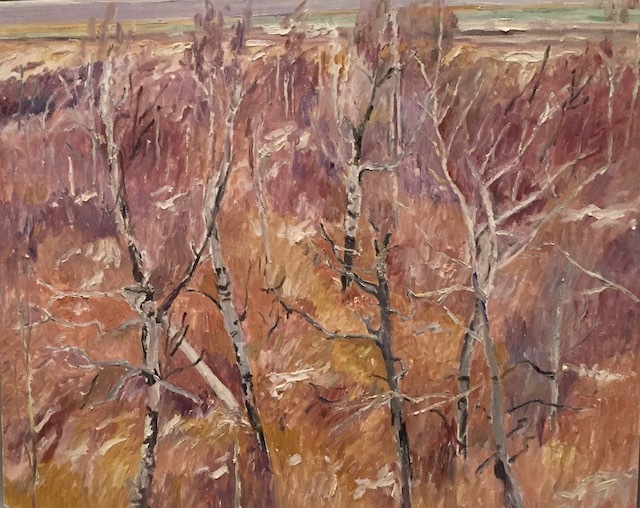 In an article in the Saskatoon Star Phoenix Dorothy says that in her work she is trying to pour onto her canvas her love of the prairie landscape, her love for the trees, and the wonderful radiance of the prairie sky. 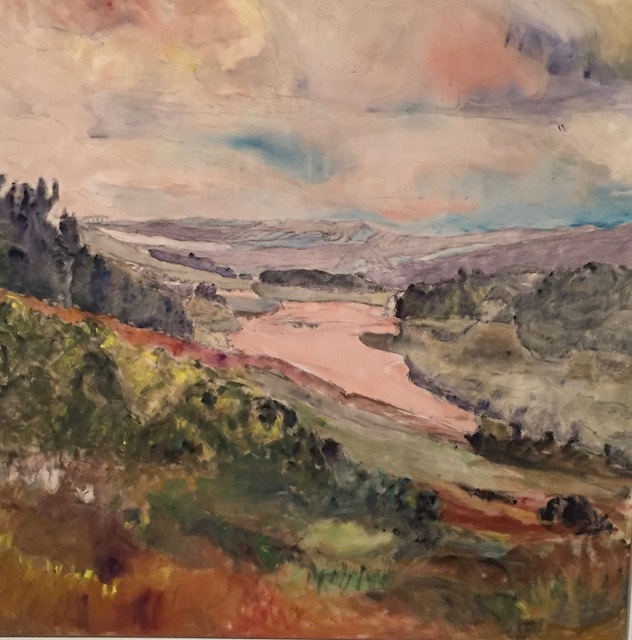 Dorothy says she simply paints what she sees but as she has grown older her eyes have been drawn to different things than they might have been drawn to when she was younger. That was an interesting idea for me to think about. Dorothy has also done some work that is more abstract. Dorothy has been painting for more than 70 years and she continues to paint and grow and change as an artist. She is an inspiration. It’s good to know that the creative process can continue even when you are in your ninth decade. It means I may still have a few decades of being creative ahead of me. What are the marks of maturity? How do you know if you have truly grown up? Many years ago I heard author and poet Judith Viorst speak at the Pantages Theatre in Winnipeg. 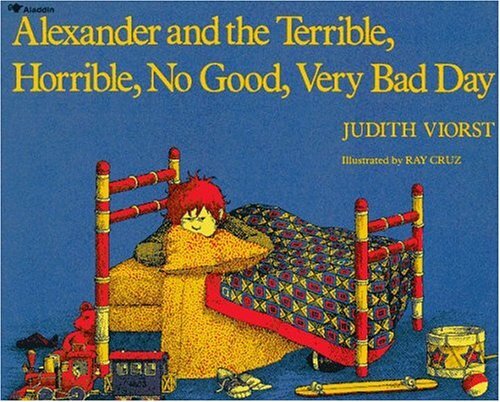 I have long been an admirer of Ms. Viorst’s children’s books like…….Alexander and the Horrible Terrible No Good Very Bad Day and The Tenth Good Thing About Barney. 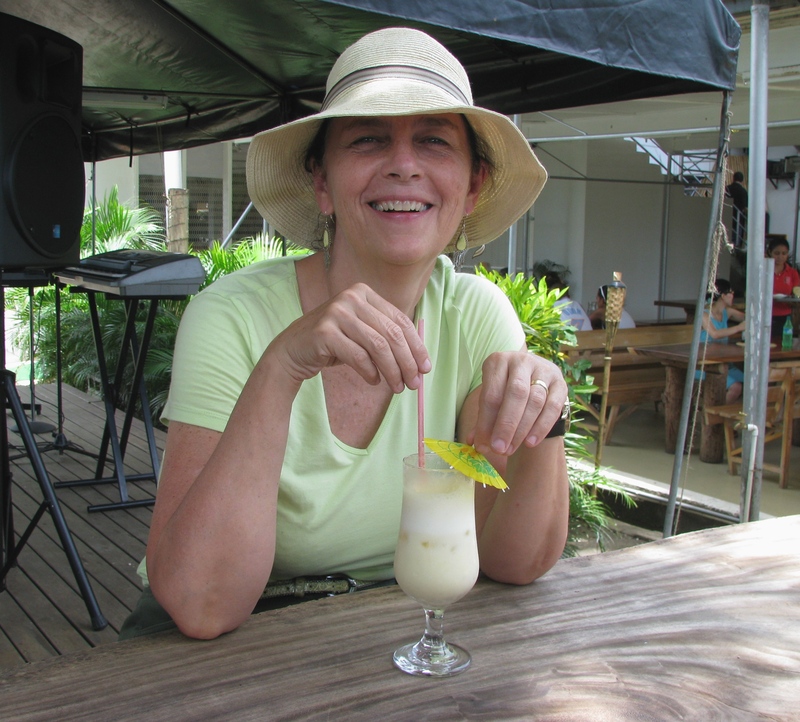 Judith also writes poetry for adults most of it about coming of age, whether that age be 40, 50, 60, 70 or 80. The night I heard her speak she used a series of highly entertaining anecdotes to illustrate the signs we should look for if we wanted to determine whether we were truly a grown up. According to Viorst being a grown up means………..
1. Realizing you aren’t necessarily everyone’s ‘cup of tea’. Some people will like you and some won’t. That’s natural and you accept it. 2. Understanding you cannot be responsible for making sure all the people you love are always happy. Your friends and family need to bear some of the responsibility for their own happiness. 3. Accepting the ‘dark’ side of your personality. Knowing you have faults but not being too judgemental of yourself. Admitting that despite your negative qualities you are still basically a good person. 4. Being firmly optimistic even when things go wrong in life. Always remembering that even when things appear catastrophic eventually healing will come and pain will diminish. 5. Having the ability to comfort yourself and the grace to receive comfort from others. 6. Committing yourself in some way to making the world a better place to live in before you die. What next? Judith Viorst ended her talk by encouraging us not to worry if we hadn’t achieved her six marks of a grownup. She told us when we quit the ‘growing up process’ we may as well quit the living process as well. For our latest sketching date my friend Esther and I went to the Winnipeg Art Gallery and were inspired by the bold and beautiful paintings of artist Norval Morrisseau. I finally finished coloring the drawing I made on our sketching date. I wonder where we will go to sketch next? 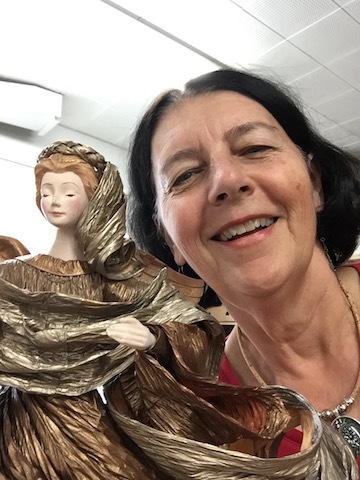 Of late I’ve morphed into the Christmas Lady at the MCC(Mennonite Central Committee) Thrift Store on Selkirk Avenue where I have been volunteering now for about five years. Inspired by the example of both my mother and mother-in-law who were volunteers in MCC stores in Steinbach, Manitoba and Leamington, Ontario for many years I decided to make that part of my retirement plan too. 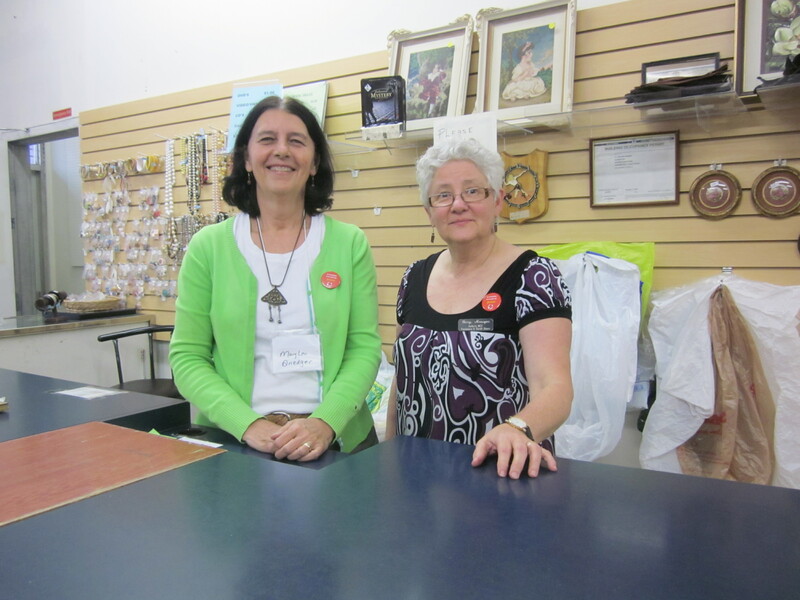 I started out working at the front counter of the store getting to know all the interesting people in the neighborhood who are regular visitors and the wonderful volunteers who operate the cash register and help clients find the items they are looking for. Then when the woman who took care of sorting and pricing books needed to take a leave of absence I replaced her for nearly a year. 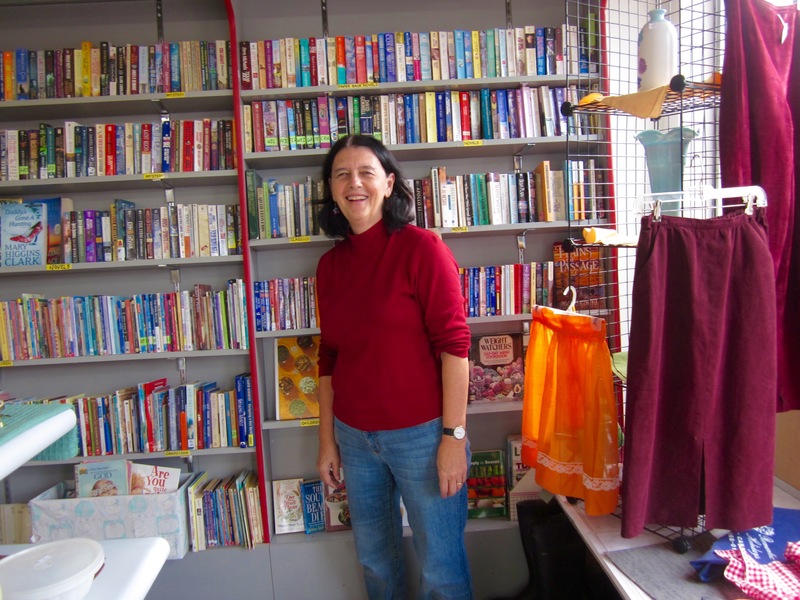 When she returned and my services were no longer needed as the ‘book lady’ I began working with a lively and interesting group of women from my church who volunteer at the Thrift Store once a week in the upstairs area, unpacking boxes and sorting and cleaning and pricing items. During my time with them I have become something of a Christmas specialist. 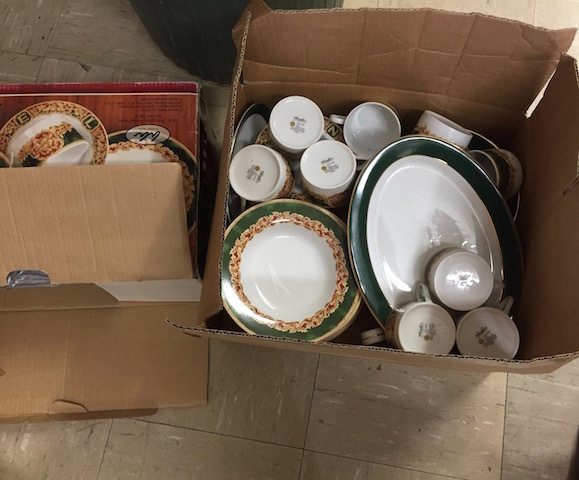 Someone donated a twelve place setting of Christmas dinnerware this week. You simply would not believe the amount of Christmas stuff that arrives at the Thrift Store each week. I organize and sort it and clean it and price it. I usually fill up four boxes or so a week with wrapping paper and wreaths, tree lights and tablecloths, candles and creches and cookie cutters. Then the boxes are taken down into the basement of the Thrift Store to be stored till Christmas. By summer that pile in the basement is HUGE! 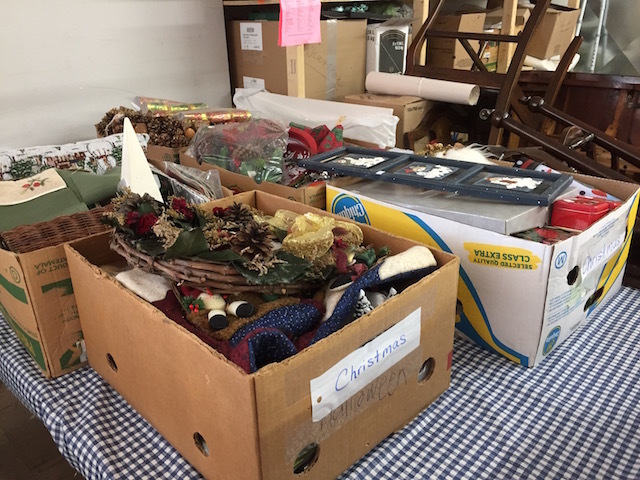 Many of the items donated to our store come from the homes of older folks who are downsizing because they are leaving their houses to move to personal care homes or assisted living facilities. It is incredible how much Christmas stuff one person or family can amass in a lifetime. It makes me determined not to add to my own Christmas cache even though many of the items I am sorting and pricing are so………. nice and I am tempted to buy them. My friend Marge with a kitchy wreath decorated with hand knitted stockings. I am continually unearthing ‘treasures’ like this. My experience at the Thrift Store has made me much more cautious and careful about buying anything new. It has taught me that we don’t need half the things we buy and most of the things we do need to buy can be purchased at a Thrift Store for less than half the price……….. including Christmas stuff. Like the screen on the heart monitor erratic and then slowing to a flatline. When I taught high school English I used the poem about smoking below to introduce my students to the art of contrast poetry. Then they had to write their own contrast poems. 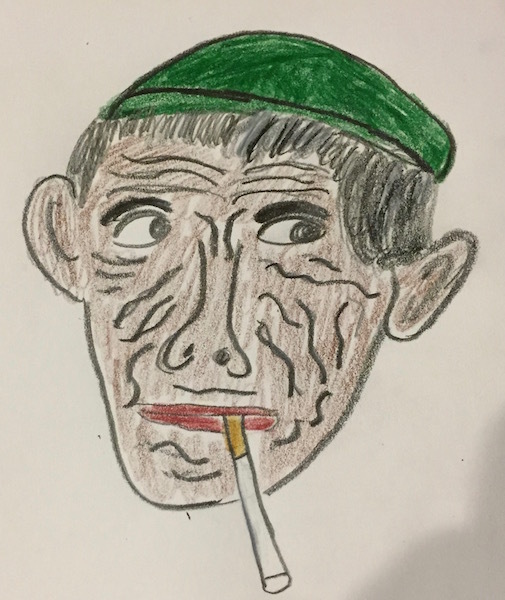 This last week the Glaser poem inspired me to write the contrast poem about aging that opens this post. 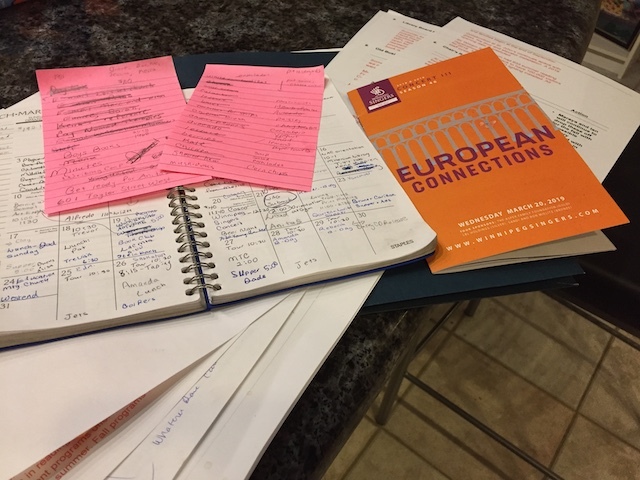 Some work of noble note, may yet be done…..
Those two quotes represent two different aspects of retirement, not necessarily in opposition to one another but requiring a fine balance. I read the first quote by Tennyson in a Macleans Op Ed written by recently retired Canadian Supreme Court Justice Beverly McLachlin. 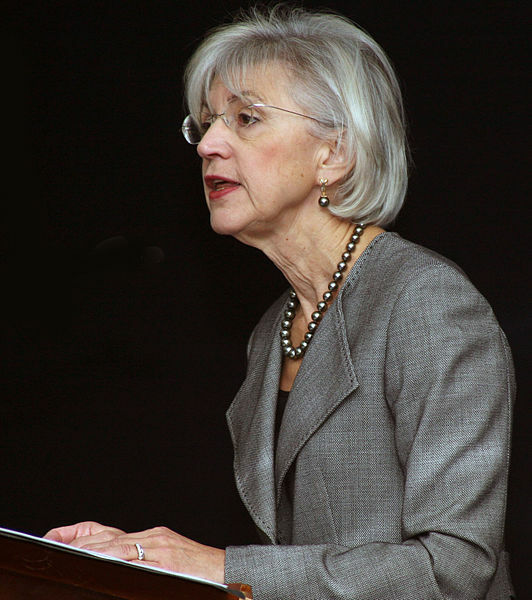 McLachlin who is some ten years older than I am, is certainly taking Tennyson’s words to heart. She just retired in December but has already completed writing a novel that will soon be published and has accepted a part-time post as a foreign judge on the Hong Kong Court of Final Appeal. She is finding ‘work of noble note’ even as she approaches the last decades of her life. I read the second quote by Browning on the Facebook page of a chaplain in a retirement facility. Retirement offers us an opportunity to take a break from constant work and really notice all the beauty around us here on earth, to ‘take off our shoes’ and soak up the wonders of nature, the kindness of strangers and the excellence of a good book. Browning warns that if we are so busy working we won’t have time to notice that beauty around us. The challenge lies in achieving a balance. Doing some noble work so we have a purpose, so we still feel like we are making some small contribution to a ‘newer world’, but also making sure we have time to revel in the beauty of the natural world, spend time with family and friends and enjoy literature, music, theatre, physical exercise, travel and art.